You, your family, and your church are invited to return to the riches of the Small Catechism. Beyond its purpose as a handbook and outline of Christian teachings, Luther’s Small Catechism is also a prayer book for every age. Not a textbook, a homework assignment, or a friend for children only. In his book, Praying Luther’s Small Catechism: The Pattern of Sound Words, author John T. Pless takes readers on a journey through the Six Chief Parts of Luther’s Small Catechism as well as the Daily Prayers and Table of Duties. Discover how these scripturally sound words (2 Timothy 1:13) shape your praying for a lifetime in the following excerpt. We give thanks to You, almighty God, that You have refreshed us through this salutary gift, and we implore You that of Your mercy You would strengthen us through the same in faith toward You and in fervent love toward one another; through Jesus Christ, Your Son, our Lord, who lives and reigns with You and the Holy Spirit, one God, now and forever. This collect composed by Luther is the real Eucharistic Prayer in the Lutheran liturgy because it gives thanks to God for the salutary gift of Christ’s body and blood and implores Him that this gift would strengthen us in faith toward Him and love toward one another. Eucharist, or the giving of thanks, is not to be confused with the Lord’s Supper; rather, it flows from it. The Small Catechism demonstrates how this is so. All this is established from the words Christ used to institute it. So everyone who wishes to be a Christian and to go to the sacrament should know them. For we do not intend to admit to the sacrament and administer it to those who do not know what they seek or why they come. Through this teaching, believers are guarded against understandings of the Sacrament that contradict the clear meaning of the Lord’s words, and they are tutored in how to make use of Christ’s gift in faith and so receive the blessings He has placed there. The catechisms were written after more than a decade of struggle involving the Lord’s Supper. This was a battle that the reformer had to fight on two fronts. On one side was the Roman Catholic Church; on the other were those associated with Ulrich Zwingli and the so-called Sacramentarians, who thought that Luther’s teaching did not go far enough in divesting the Lord’s Supper of Roman errors and restoring it to a genuine remembrance of Christ. The catechisms, each in its own way, sought to address the errors of both groups. For the Roman Church, the key category for the Sacrament was that of sacrifice. While Luther also recognized other crucial errors (including the teaching of transubstantiation and the withholding of the chalice from the laity), the notion of sacrifice was the chief error because it reversed the direction of the Sacrament so that instead of Christ’s body and blood being a testament received for the forgiveness of sins, it became a ritual work done to merit grace. Early in the controversy with Rome and consistently thereafter, Luther insisted that the Sacrament and sacrifice must be kept distinct. Luther held that the Roman doctrine of transubstantiation was an unbiblical and clumsy philosophical attempt to explain how Christ’s body and blood are present in the Sacrament, but he did agree with Rome that Christ’s body and blood are present. They are present, however, not as an offering to God but as God’s gracious testament to sinners to be received in faith. On the other side of the battle field were the Sacramentarians, who denied the bodily presence of the crucified and risen Christ under the bread and the wine. For them the Lord’s Supper was not the testament of the forgiveness of sins bestowed in the Lord’s body and blood under bread and wine, but an ordinance to remember Christ and partake of Him by obedient faith in thanksgiving. Charles Arand observes that the Small Catechism addresses both of these errant positions: the questions “What is the Sacrament of the Altar?” and “How can bodily eating and drinking do such great things?” are aimed primarily at the Sacramentarians, and the questions “What is the benefit of this eating and drinking?” and “Who receives this sacrament worthily?” address the Roman Church. With brevity and without polemic, Luther crafts a compact confession of the Lord’s Supper that is remarkable for its clarity and fullness. With an economy of words, Luther answers his opponents, but more than that, he provides a clear definition of the Sacrament, accents its benefits for faith, and addresses its use by believers, all while keeping his explanation firmly anchored to Jesus’ words. See Babylonian Captivity (1520): “We must therefore sharply distinguish the testament and sacrament itself from the prayers which we offer at the same time” (AE 36:50). Wilfried Härle is right to assert: “I am deliberately not using the widespread term ‘eucharist’ (=‘thanksgiving’), which arose in the second century (Didache 9,1 and 5; Ignatius’ Letter to Ephesians 13,1) and depended upon the liturgical prominence of the consecration of the bread in the Lord’s Supper (1 Cor. 11:24). The term ‘eucharist’ has admittedly found wide acceptance in ecumenical circles, but as a term, it has only an unspecific, and thus misleading, relationship to the origin and meaning of the Lord’s Supper. Its use can give rise to the impression that the essential feature of the Lord’s Supper is the congregation’s giving of thanks” (Outline of Christian Doctrine, trans. Ruth Yule and Nicholas Sagovsky [Grand Rapids: Eerdmans, 2015], 454). LC V 1–2; K-W 467. See Treatise on the New Testament (1520) (AE 35:99). See also Carl Wisløff, The Gift of Communion: Luther’s Controversy with Rome on Eucharistic Sacrifice, trans. Joseph Shaw (Minneapolis: Augsburg, 1964). Charles Arand, That I May Be His Own, 171. Selected paragraphs from chapter 7 of Praying Luther’s Small Catechism: The Pattern of Sound Words, pages 109–18 © 2016 by John T. Pless. Published by Concordia Publishing House. All rights reserved. 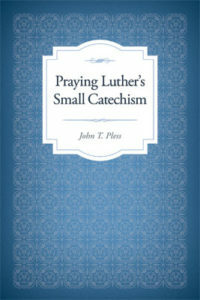 To order Praying Luther’s Small Catechism, visit www.cph.org or contact CPH at 800-325-3040.